It’s called computer-assisted coding for a reason, right? Healthcare organizations sporting the technology have learned that coders are more essential than ever. While technology such as encoders and remote coding has long been a part of the coding process, for many, computer-assisted coding (CAC) is still a brand-new, and maybe even scary, concept. The AHIMA defines CAC as the “use of computer software that automatically generates a set of medical codes for review, validation, and use based upon clinical documentation provided by healthcare practitioners.” There are currently two forms of CAC: natural language processing (NLP) and structured input. NLP electronically reads narrative text or voice documents and uses computer-based reasoning to identify key words, analyze their context, and come up with the appropriate code. Meanwhile, structured input allows the physician to create a record and pick specific diagnostic phrases to which a code will be automatically derived based on that phrasing. An improvement in productivity is one of the reasons to implement the technology, says Jason Burke, CAC program manager at 3M Health Information Systems. “Each coder is able to code faster and code more and, at the same time, ensure that coding compliance and accuracy standards are met,” he says. Because there is a shortage of qualified coders and the need for coders is predicted to rise, CAC can help organizations do more coding with less staff and in less time, he says. Additional benefits include a boost in coding accuracy and more complete records, says Burke. “Coders can make good use of a system that can go in and read text documents or patient medical records and provide feedback to the coder to ensure they’re capturing all of the necessary diagnosis and procedure information,” he notes. It would seem logical to assume that CAC would diminish the role of coders. Not so, says Toren. “Good NLP doesn’t impact the importance of coders; they will always bring value in their ability to edit and review technology’s coding performance because the more complicated reports are the ones with the greatest risk and reward,” he says. 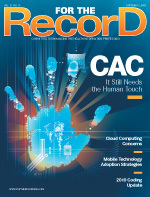 Prior to letting a system code and bill directly, it needs to undergo relentless testing to enable coders to get comfortable with what will not be reviewed, according to Jean Bishop, MSPH, MBA, RHIT, CPC, CFE, CPhT, a consultant who has worked with healthcare organizations considering CAC adoption. “In the vast majority of the cases I have dealt with, the adoption of this technology is not yet at the level of having no [human] review at all,” she adds.